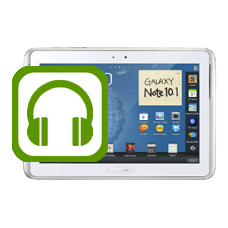 Has your Galaxy Note 10.1 started to develop headphone socket issues? Perhaps you may not be able to fully insert the headphones jack plug into the socket or you can not play music through the headphones. If so then the headphone socket is likely to be at fault. Another common symptom of headphone socket failure is that sound is only present in one of the earphones. * Price includes the brand new Galaxy Note 10.1 (GT-N8000, GT-N8010, GT-N8020) headphone jack replacement and fully insured return shipping in the UK. This is an in-house Samsung Galaxy Note 10.1 repair service, when ordering this Galaxy Note 10.1 repair service you are required to ship the Note into our repair centre for works to be completed.